The PPHP153M is a powered, wide-coverage, two-way loudspeaker that covers the complete audio spectrum, boasting 1,200 watts of full-range, distortion-free power. It pushes everything from pounding bass to a chirpy high-end, all in one amplified cabinet. And now you can play your MP3s directly through this speaker, with no additional equipment - simply plug in your USB stick and push play! There's also an LCD readout on the back so you can navigate through your music files with ease. This speaker comes equipped with XLR and ¼' mic inputs as well as a standard RCA input to accommodate both voice and any electronic instrument simultaneously, each with its own volume control. Adjust the sound to your own specifications using the bass and treble controls. It has a 35mm pole mount socket for a multitude of speaker stand applications. You'll get crystal-clear acoustics in your home as a monitor. 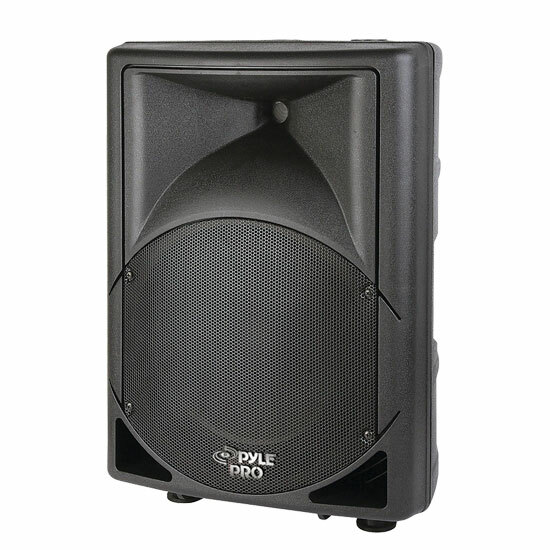 It's also ideal for bands and DJs as a main PA or instrument amplification system, so you can rock the audience anywhere, at the club or a party. And you'll always be ready for the next gig - these speakers are compact enough to be truly portable. The 1.75' state-of-the-art titanium drivers and 15' subwoofer are protected by a metal grill, so you know your sound is secure.